To provide rural women farmers better access to knowledge and information as well as to revitalize agricultural extension and education in rural areas, the Self Employed Women’s Association (SEWA) of India joined hands with ICRISAT to carry out ICT-based knowledge sharing platforms and other agricultural innovation initiatives. Women farmers are more able to adapt to better farming techniques and increase yields and production, when agricultural information and resources are available to them. The overall goal of the ICRISAT-SEWA ICT platforms is to harness the opportunities that new information tools can bring to women farmers to improve productivity and profitability of smallholder agriculture. 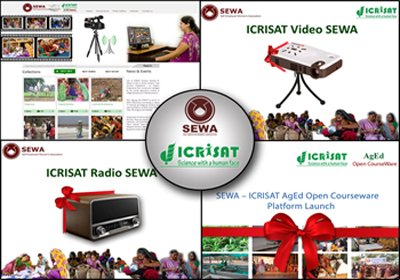 The ICT platforms, developed by ICRISAT, include the SEWA KSIConnect, a virtual learning exchange and knowledge transfer series; the SEWA AgED Open Courseware that promotes open online courses for enhancing skills of SEWA members; the ICRISAT Radio SEWA; and the ICRISAT Video SEWA that will provide agro-advisories on agricultural innovations developed by ICRISAT. All these will be carried out through farmers’ groups and farmer field schools established by SEWA. These platforms will enable SEWA to reach out to a larger number of women farmers and help them with valuable information from experts to address their agriculture-related needs and concerns. The partnership between ICRISAT and SEWA was sealed on 16 May with the signing of a Memorandum of Understanding that includes areas for collaboration in the adoption of the inclusive market-oriented development approach, capacity building and training, gender research, rural livelihoods, natural resource management, village level studies, and use of innovative ICT platforms to boost smallholder agriculture in rural areas. “Millions of smallholder farmers worldwide could improve their yields, incomes and resilience if only they had better access to appropriate information and knowledge that helps them make informed choices about farming practices,” said Dr William Dar, ICRISAT Director General, during the agreement signing and launch of the ICT platforms. “Working with partners and stakeholders like SEWA, ICRISAT has developed and supported many information systems that have helped smallholder farmers become more food secure and resilient,” Dr Dar added. He also appreciated the remarkable work that SEWA has been doing in bringing changes in the socio-economic status of rural women by improving their livelihoods. He announced ICRISAT’s support in scaling up the institute’s scientific solutions and innovations through SEWA’s institutional mechanism. “With ICRISAT partnership, we are hoping to empower smallholder farmers by bringing innovative ICT tools in their hands, allowing them access to advanced scientific and technical knowledge, weather information and appropriate advisory and knowledge services,” said Ms Reema Nanavathy, Director, SEWA. “The new approach to capacity building through ICT envisions a world in which all stakeholders can easily access and share information, knowledge and skills they need — anywhere and anytime — in a cost effective manner,” said Dr Guntuku Dileepkumar, Global Leader, ICRISAT’s Knowledge Sharing and Innovation (KSI) program. During the launch, SEWA members in Ahmedabad, Gujarat were connected to their counterparts in Sri Lanka, Nandasam and two other villages through KSIConnect, making them appreciate better the power of innovative ICT tools. Battery-operated Pico projectors were also distributed to master trainers of SEWA. Dr Dar, along with Dr G Dileepkumar and Dr Suhas P Wani, Director, ICRISAT Development Center were in Ahmedabad, Gujarat on 15-16 May for the agreement signing and launch of the ICT platforms, and where they interacted with the SEWA team, visited the Vanalaxmi Tree Growers Cooperative, and inaugurated the Community Learning and Business Resource Center (CLBRC) of SEWA at Nandasam village. Coffee smallholder farmers in Uganda can now look forward to better entrepreneurship and agribusiness opportunities and become stronger players in the coffee value chain with the launch of the Consortium for Enhancing University Responsiveness to Agribusiness Development (CURAD). CURAD also aims to work towards becoming the leading generator of young agribusiness entrepreneurs to create jobs and wealth in East Africa. ICRISAT’s Agri-Business Incubation (ABI) program has facilitated the establishment of CURAD, an agribusiness incubator that will work along the coffee value chain, at the Makerere University Agricultural Research Station, Kabanyolo in Kampala, Uganda. CURAD is one of the six agribusiness incubators being established under the Forum for Agricultural Research in Africa’s initiative on Universities, Business and Research in Agricultural Innovation (FARA-UniBRAIN) project with mentoring support from ICRISAT-ABI of the institute’s Agribusiness and Innovation Platform (AIP). 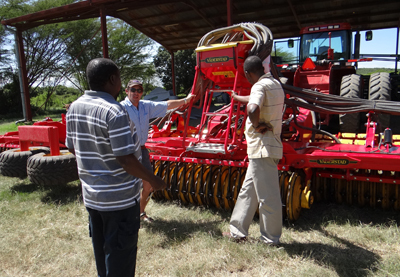 “FARA is committed to help the African farming community through initiatives like CURAD. We will work towards promoting agro-entrepreneurs in Uganda and elevate the position of Ugandan coffee in the international market,” said Dr Yemi Akinbamijo, Executive Director, FARA and chief guest during the launch. In his keynote address, Dr Kiran K Sharma, CEO, ICRISAT-AIP, highlighted ABI’s efforts in mentoring 22 agribusiness incubators in India and in establishing five Food Processing Business Incubation Centers in Africa under the India-Africa Forum Summit-II. He also spoke of extending support to all Agribusiness Innovation Incubator Consortia (AIIC) established under FARA-UniBRAIN and in exploring opportunities to scale-up this unique initiative across different African nations and work towards their sustainability. “The Danish Government contributes about US$ 2 billion every year for various development activities across the globe and it will continue to support initiatives like UniBRAIN in the African continent,” said Mr Henrik Vistisen, Senior Adviser, Ministry of Foreign Affairs, Denmark. “The AIIC established under the UniBRAIN initiative is committed to carry out extensive entrepreneurship activities in Africa and contribute immensely to the overall development of different nations,” said Mr Alex Ariho, UniBRAIN facility coordinator. Others who spoke during the launch were: Mr Joseph Nkandu, Executive Director, National Union of Coffee Agribusinesses and Farm Enterprises (NUCAFE); and Dr Samuel Kyamanywa, Principal Investigator of CURAD. Hon Gerald Ssendaula, CURAD Board Chairperson; Prof Bernard Bashasha, Principal, College of Agriculture and Environmental Sciences, Makerere University; Ms Irene Frempong, Director, FARA; and many other dignitaries were present during the program. Officially launched on 9 May, CURAD is primarily promoted by the Makerere University, NUCAFE, the National Agricultural Research Organization (NARO), the University of Copenhagen, and NIRAS International. FARA also organized a UniBRAIN steering committee meeting on 8 May, where Mr Ariho presented the progress and scaling-up strategy of UniBRAIN. Mr S Aravazhi, COO, ICRISAT-ABI, presented the institute’s experiences in successfully running the Network of Indian Agribusiness Incubators (NIABI) and the way forward for the African Agribusiness Incubation Network (AAIN) leading to the formation of the Global Agribusiness Incubation (GABI) network. 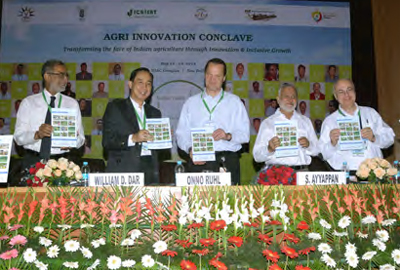 Binging public and private sectors together in promoting innovations, partnership and entrepreneurial climate in the Indian agricultural sector, the Agri Innovation Conclave 2014 concluded successfully in New Delhi on 18-19 May. 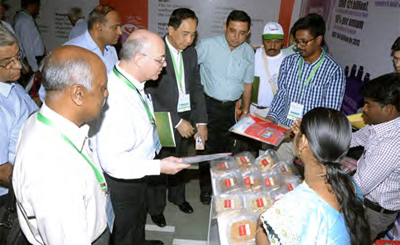 products’ stall in the expo organized at the conclave. The Conclave was the culmination of the Krishi Parivartan Yatra, a train journey of 50 National Agricultural Innovation Project’s (NAIP) farmer beneficiaries across five cities to share success stories on agri-ventures, and the Agri-Biz Idol Camps held to reach out to the youth and start-up entrepreneurs. The Conclave convened agribusiness experts, professionals, and other stakeholders from across the country, on a common platform to share NAIP’s success and conceive path breaking ideas for strengthening the future of agribusiness in India. Organized by of the NAIP of the Indian Council of Agricultural Research (ICAR), in collaboration with the Agri-Business Incubation (ABI) program of ICRISAT, the two-day Conclave marked the successful completion of NAIP, showcasing success stories and best agri- innovative products developed under the project. “This is just the beginning of big things to come. Transformation is important to enable economies to progress. One of the best ways to achieve this is to promote entrepreneurship in the agricultural sector. Entrepreneurs act as major building blocks of the economy anywhere in the world today. 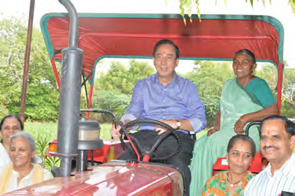 Agribusiness incubation is the only way to solve the many and diverse challenges faced by entrepreneurs,” said Dr William Dar, Director General of ICRISAT, in his special address at the Conclave. 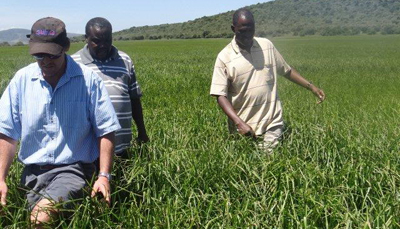 “For us, the parameters of success have been the farmers and their growth. We call it an agricultural transformation, as we intended at the end of these five years of NAIP implementation. It has all been about giving, enabling and empowering our fellow farmers,” said Dr S Ayyappan, Director General, ICAR. The dignitaries during a book launch at the event. “ICAR is trailblazing in many ways. NAIP has benefited about 200,000 farmers in five years. This is the ultimate test of success of any development project and NAIP certainly passed it with flying colors,” said Dr D Rama Rao, National Director, NAIP. 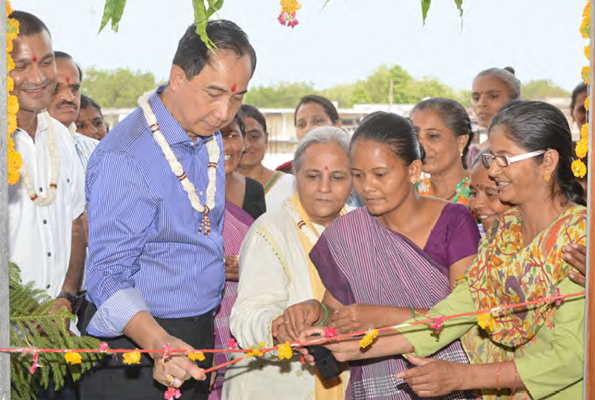 “The joint effort of ICRISAT-ABI and NAIP’s Business Planning and Development (BPD) units has brought in a great change in the entrepreneurial system in the country. This success has to continue and the BPD operations must attain sustainability,” said Dr Kiran K Sharma, CEO, Agribusiness and Innovation Platform (AIP), ICRISAT. Dr Ramadjita Tabo, ICRISAT Director for West and Central Africa, visited staff and partners in Niger from May 11 to 17 as part of his first regional tour. 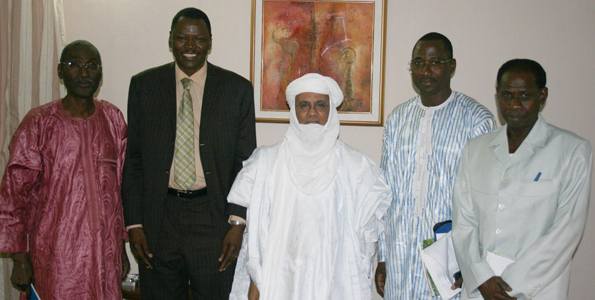 During his mission, Dr Tabo held high-level talks with officials and partners in Niger. Dr Tabo met the Prime Minister of Niger, His Excellency Brigi Rafini and Foreign Minister Mr Mohamed Bazoum, and expressed ICRISAT’s deep appreciation of their support to the institute. He also provided updates on projects and programs in progress and the prospects for future collaboration within the framework of the CGIAR Research Programs. 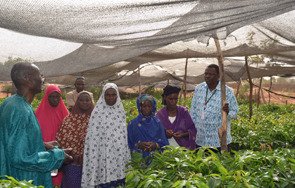 The Government of Niger reaffirmed their support to ICRISAT’s mandate. Dr Tabo also met Ms Martine Therer, Deputy Resident Representative and Program Director, United Nations Development Programme (UNDP); Mr William Rastetter, Representative of the Catholic Relief Services; Mr Oumarou Malam Issa, Representative of the Institut de Recherche pour le Dévéloppement (IRD); and Mr Ahamadou B. Ndiade, United States Agency for International Development (USAID) Food for Peace Officer. Other meetings included senior staff of the African Centre of Meteorological Application for Development (ACMAD) and the Centre for Application in Agro Meteorology and Operational Hydrology (AGRHYMET), and members of the Sadoré Village Women Association involved in market gardening activities. In his meetings, Dr Tabo referred to the quality of partnership in Niger and discussed opportunities to further strengthen ties through better integration of projects and programs for the benefit of smallholder farmers in West and Central Africa. 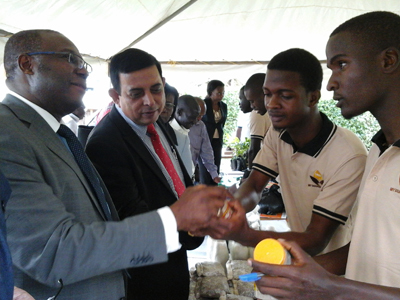 At the Sadoré station, Dr Tabo interacted with ICRISAT scientific and support staff and toured its research facilities. finger millet and sorghum to Drs H Ojulong and E Manyasa. Researchers of IER and ICRISAT during the collaborative meeting held at ICRISAT Samanko station in Mali. 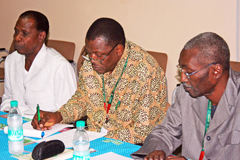 (L-R) Dr A Ichaou, Dr R Tabo and Dr M Gandah at the meeting in Niger. To strengthen research collaborations and partnerships between ICRISAT and the national agricultural research systems (NARS) in West and Central Africa, a series of collaborative meetings was held in the region and areas of research partnership were discussed and formalized. The first series of meetings was organized on 8 May at the ICRISAT Mali station in Samanko. Senior researchers from ICRISAT and from the Institut d’Economie Rurale (IER), Mali discussed research projects and programs embedded in the CGIAR Research Program framework namely: Dryland Cereals, Grain Legumes, Dryland Systems, and Climate Change, Agriculture and Food Security. Discussions were held on opportunities in millet, sorghum and groundnut improvement, and in research facilities and germplasm exchanges. Dr Ramadjita Tabo, ICRISAT Director, West and Central Africa, said, “The goal of the collaborative meetings is to revive joint working groups that will then identify and strengthen areas of partnerships. The approach is to consolidate the gains and transfer them to producers. Indeed, IER and ICRISAT are already engaged in collaborative work, but joint working groups will enable us to better know each other as we also have new staff members.” During the meeting, IER scientists and researchers presented their research programs and projects. In a series of meetings in Sadoré, Niger, researchers from ICRISAT and from the Institut National de Recherche Agronomique (INRAN) discussed their perspectives for future joint research. 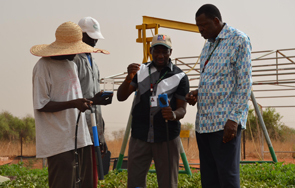 IER and INRAN have been ICRISAT’s main hosts and partners in Mali and Niger, respectively for over three decades. At the first general assembly of the Centre for Coordination of Agricultural Research and Development for Southern Africa (CCARDESA), various stakeholders convened in Gaborone, Botswana on 6-7 May to deliberate on agricultural research and development priorities for member states of the South African Development Community (SADC). ICRISAT was represented by Dr Siambi, Dr Kizito Mazvimavi, Country Representative, Zimbabwe, and Dr Harvey Charlie, Senior Scientific Officer, Lilongwe, Malawi. The stakeholders included ministries responsible for agriculture and food security, the agro industry, agricultural education institutions, CGIAR, farmer organizations, and civil society organizations of the 15 member states of SADC. CCARDESA is a sub-regional research organization created by SADC member states to coordinate agricultural research and development in the SADC region.